Luxury real estate investors these days often prefer to purchase properties in the beautiful beachfront locations. The beachfront lifestyle is unique and very relaxing and so, most people prefer buying properties located directly on the ocean. Other investors, who are looking for vacation properties, also show a lot of interest in buying luxury beachfront residences because it is a lot easier to rent them out. Today, luxury beachfront condominiums and residences are also available on a rental basis and so, those people who are looking for rental properties can have these properties on a rental basis. In this present age, many people have to relocate to various places for business purposes and for their profession and so, these people look for short-term rental properties for residing in a place for a short period of time. The demand for rental properties is very high today, in the real estate market, and to meet this rising demand, many real estate companies are offering units in the luxury condominiums and beachfront residences for rent. Thus, the units in the beachfront luxury condominiums are offered by the realtors for sale, as well as for rent. Jade Beach is a very popular luxury condominium, located in the gorgeous Sunny Isles Beach and if you are looking for a beautiful, lavish rental property in the Sunny Isles area, you should go for Jade Beach rentals. Jade Beach is a very safe and gated community and so, the residents can feel completely safe by residing in this building. People, who are not quite ready to buy luxury properties in the present day, can certainly go for rental properties. For them, residing in a rental unit of a luxury condominium is the best option, as they can enjoy all the luxury facilities and amenities offered in the luxury condominium. Fort Lauderdale and Downtown Miami is a short distance away from Jade Beach, and the proximity of this property to all the major areas of the city and to the ocean makes it an ideal residential and vacation property. Jade Beach condos are available for rent and you can choose a unit from a variety of options, as per your needs and budget. The building’s extraordinary features and very impressive amenities make it the first choice of the condo buyers, as well as the people looking for luxury rental properties. Thus, the demand for the property is very high, especially during the high season. 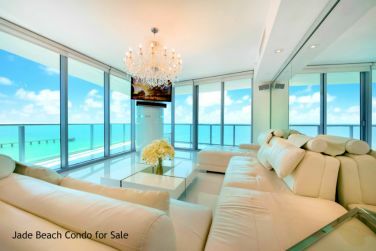 In order to get details regarding monthly or annual rentals please contact One Sotheby’s International Realty at (305)336-0457 which is located directly across the street from Jade Beach tower.